Hi everybody, I had long ago read about hiding information inside text files using notepad and today I suddenly remembered while doing some other task. 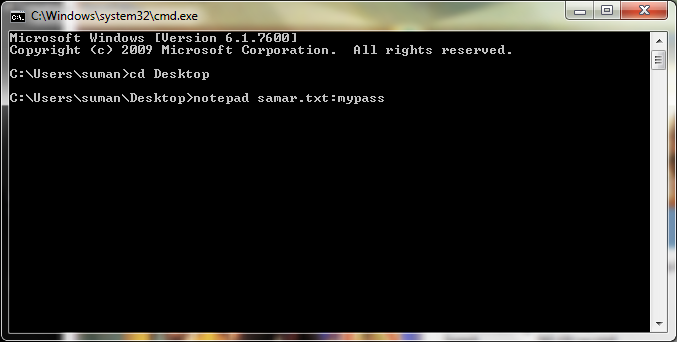 So I am sharing this little trick of hiding information inside the text file using notepad. Replace filename part and password with yours as shown in the screenshot above and then you will be asked if you wish to create a new file or not(See the screenshot below) and then click on Yes to create the file. Now enter your secret information in the file and save the file. Close the file and if you need to access the contents later, you will have to use the exact command you used while creating the file. If you or someone else edits your file without giving the password, your original hidden content will not be erased and you can still access the content with your original command. Steganography is the art and science of hiding information such that only the sender and recipient can read that hidden piece of information. While the cryptography is focussed on making message unreadable, steganography focusses on data hiding and hence combination of both can give better security in most cases. As mentioned earlier, steganography is the art of hiding information and can be done in many ways. For instance, simplest forms of steganography would be toinsert each character of hidden message in the Nth position of each word in a sentence so that recipient takes Nth letters of each words to reconstruct the message. While this was very basic example, steganography has no bounds and one can hide messages within images, audios, videos, source codes, etc and this involves some sort of creation to increase the obscurity of the hidden message. Wikipedia entry gives far much deeper information on steganography tool and I would like to recommend you to read it. To make digital steganography easier, numerous tools have been developed and I'm listing some of them here. 1) Hide in Picture: Hide In Picture is a program that allows you to conceal files inside bitmap pictures, using a password. The pictures look like normal images, so people will not suspect there is hidden data in them. 2) wbStego: wbStego4 offers steganography in bitmaps, text files, HTML files and PDF files. It is has two very user-friendly interfaces and is ideal for securely transmitting data online or adding copyright information, especially with the copyright information manager. 3) Hide4PGP: Hide4PGP is a freeware program distributed as source code in ANSI C and precompiled executables for DOS (any version but 1.x), OS/2 (Warp and up), and the Win32 console (9x and NT). It's purpose is to hide any data in a way that the viewer or listener does not recognize any difference. It supports BMP, WAV and VOC file formats. 4) MP3Stego: Hide files within mp3 files. MP3Stego will hide information in MP3 files during the compression process. The data is first compressed, encrypted and then hidden in the MP3 bit stream. 6) GifShuffle: gifshuffle is used to conceal messages in GIF images by shuffling the colourmap, which leaves the image visibly unchanged. gifshuffle works with all GIF images, including those with transparency and animation, and in addition provides compression and encryption of the concealed message. 7) Snow: snow is used to conceal messages in ASCII text by appending whitespace to the end of lines. Because spaces and tabs are generally not visible in text viewers, the message is effectively hidden from casual observers. And if the built-in encryption is used, the message cannot be read even if it is detected. 8) Camouflage: Camouflage allows you to hide files by scrambling them and then attaching them to the file of your choice. This camouflaged file then looks and behaves like a normal file, and can be stored, used or emailed without attracting attention. 9) OpenPuff: OpenPuff is a professional steganography tool, with unique features you won't find among any other free or commercial software. OpenPuff is 100% free and suitable for highly sensitive data covert transmission. Its very advanced tool with support to images, audios, videos, flash, adobe. 10) SteganRTP: Steganography tool which establishes a full-duplex steganographic data transfer protocol utilizing Real-time Transfer Protocol (RTP) packet payloads as the cover medium. The tool provides interactive chat, file transfer, and remote shell access. A network steganographic tool.